Microwave ovens have been a part of many American households since the late 1970s and most users quickly learned to keep aluminum foil and metal utensils out of this appliance. That burst of sparks was an easy clue, and the ensuing fire and ruined microwave were the final answers. Cooking fires are the leading cause of reported house fires, resulting in 430 deaths and more than $1.1 billion in property damages. The microwave offers as much potential danger as a neglected pan of food left on the stove. For the preservation of your microwave and the health of your family, here are 13 things (in addition to metal) that should never be placed in the microwave. While polystyrene foam or Styrofoam containers do a good job in protecting foods in the refrigerator, they aren't made for the microwave. A form of plastic, the foam can melt in the microwave, allowing chemicals to be released into your food. 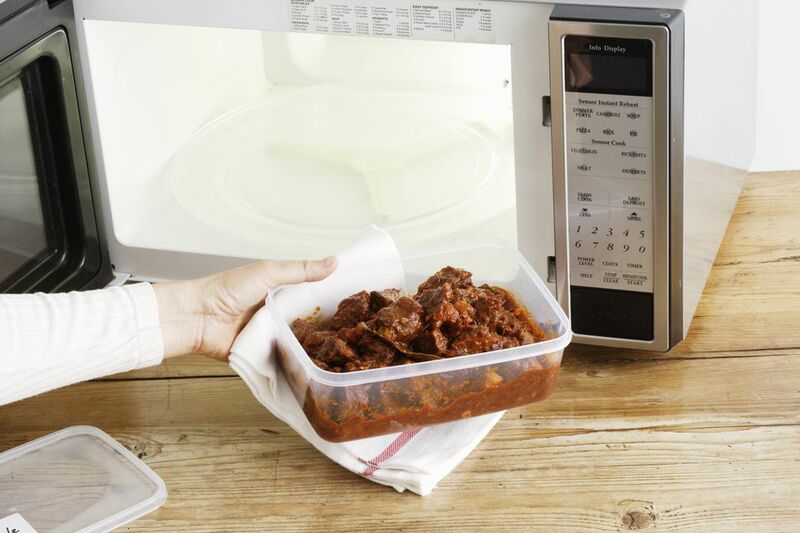 Transfer the food to a microwave-safe container before heating. Unless the paper bag is developed for use in the microwave, like popcorn bags, it is not safe to use for reheating. Brown paper lunch bags and printed paper takeout containers can release toxins into foods and can easily catch fire if the food becomes too hot. And don't forget that those paper Chinese food containers often have a thin metal wire handle that can create sparks and flames to ruin your microwave. Keep grocery bags and any other lightweight plastic bags out of the microwave. They will melt! The same rule should be followed for margarine, yogurt, and cottage cheese tubs that are meant only for cold storage and one-time use. It may seem earth-friendly to reuse them, but it's not worth the risk of the chemicals released into your food during heating or a fire caused by the container melting. Many plastic containers contain Bisphenol-A or BPA, a chemical that has been linked to numerous health issues from cancer to diabetes. Heating the plastic releases the BPA into the food. Take the time to check that any plastic storage container is labeled as microwave-safe before hitting those buttons. If your coffee needs to be warmed up, use a glass or porcelain mug to heat it in the microwave before you pour it into a travel mug. Most mugs, cups, and bottles are made of plastic or stainless steel. You know that metal is a no-no for the microwave and it will actually prevent the beverage from being heated. Plastic mugs may not be safe and can even separate and ruin the insulation that keeps the beverage hot. If you have some vintage Fiestaware or any dishware that is more than 40 years old, don't use them in the microwave. The glaze could contain lead or other components that will leach into food when heated to high temperatures. Any gold or silver-gilded dishes should also be avoided. Unless you like cleaning the microwave, make sure that every container is covered. A plain white paper plate, paper towel, or a purchased vented microwave cover will make your life much easier. This may seem out of place, but there are "hacks" floating around the internet that you can dry fabrics in the microwave. Never put any type of linens or clothing in the microwave. Your damp shoes will never be the same. Whether there is the potential for explosion, eye-burning fumes, or unsafe temperatures, there are some foods that should not be prepared in the microwave. Hot Peppers: Unless you like the effects of pepper spray, avoid placing chili peppers in the microwave. The heat releases the capsaicin in the peppers and causes it to vaporize, burning your eyes, nose, and lungs. Eggs in the Shell: As the egg heats, all that steam has nowhere to go in the shell until it builds to the point where the egg explodes—even if you place it in a dish with water. Whole Fruits: Placing grapes, whole apples, or pears in a microwave can cause an explosion when the steam builds up inside the skin or create a serious burn when you try to open the steaming hot fruit. Frozen Meats: One of the benefits of the microwave is the quick, intense heat to thaw and cook frozen foods. One of the foods that should be monitored carefully is frozen meat. Because the meat is usually thick—especially ground beef—it is difficult to ensure that the center is fully-cooked. This can result in over-cooked areas while some spots are still raw and filled with dangerous bacteria like E.coli. Frozen Breast Milk: Breast milk should be thawed in the refrigerator instead of the microwave. Uneven heating is dangerous and can burn the baby's throat. Finally, never turn on the microwave when it is empty. When the microwaves have no destination like liquids or food, they bounce off each other and are reabsorbed into the microwave, which can cause it to explode and start a potentially deadly fire.